^ Comcast 2011 Annual Report. Comcast.com. [2013-03-17]. ^ Lieberman, David. "Comcast Completes Acquisition of GE’s 49% Stake in NBCUniversal", Deadline.com, 2013-03-19. ^ "TEA/AECOM 2014 Theme Index & Museum Index: The Global Attractions Attendance Report" (PDF). [4 June 2015]. ^ Universal Studios Hollywood, Los Angeles, Hollywood. Universal Studios Hollywood. [August 21, 2010]. 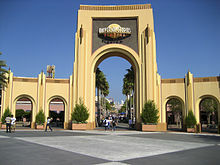 ^ Theme Parks at Universal Orlando Resort. Universal Orlando. [August 21, 2010]. ^ Universal Studios Japan. Universal Studios Japan. [August 21, 2010]. ^ Resorts World Sentosa - Universal Studios Singapore. Resorts World Sentosa. [August 21, 2010]. （原始内容存档于2011年10月5日）. ^ UPDATE 1-Universal Studios plans Beijing theme park. Reuters. February 11, 2010 [August 21, 2010]. ^ Hart, Lance. Universal Studios Dubailand. Screamscape. [August 21, 2010]. （原始内容存档于2011年7月16日）. ^ 무단전재, Ⓒ 종합 경제정보 미디어 이데일리-상업적; 금지, 재배포. 수공 `화성 송산그린시티 유니버셜스튜디오 개발사업 무산` [Waterworks `Hwaseong Songsan Green City Universal Studio Development Project`]. edaily. 16 January 2017 （韩语）.